As a sailor, I always wanted to go on Windstar; it far exceeded my expectations. Kudos to Gede, assistant Maitre D, his boss Santos and Chef Oman for delicious meals that met our dietary restrictions. Kudos to Lufi, Cabin Steward, for a fragrance free chemical free cabin. Loved the marina, thanks to Jose for taking us each out for a sail on the Hobie cat. Enjoyed having the snorkel mask and fins provided by the marina; excellent fit. The itinerary is excellent, with long days on shore at each port. Very friendly people, engaging and well traveled, plenty of deck chairs, great crew show, Excellent gym with a recumbent bike and many classes.would definitely go on Windstar again. The cabin is small but very compact. Be sure you sign up for dinner at candles and Stella and for the barbecue and dining under the stars the last three nights. Pigeon Island, St Lucia is a luncheon barbecue on the beach. Sorry we did not sign up for the Wi-Fi package as it was a hassle to find Wi-Fi in the ports, and when we did it was usually spotty. Ports: St Maarten: We stayed at the DIvi the night before; just terrific. Barbuda: call walk on the beach. Dominica: very mountainous tropical one lane roads so be prepared to spend a lot of time driving around. We booked privately with Antours to see the indigenous Carib, Annison himself was very interesting. Also did hot springs. Need to walk out of the port area, follow the yellow lines, if you want to do an excursion not part of the ship. Pigeon Island St Lucia: The ship does a beach barbecue at this port, probably due to the miserable traffic. 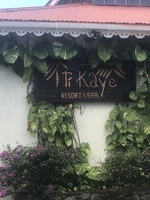 We took a private tour with James Touring Service in his 4 wheel Jeep, necessary if you want to go snorkeling at Ti Kaye resort as the driveway is extremely steep.Excellent snorkeling, lots of beautiful fish, clear water, pleasant lunch. James is very sweet, knowledgeable and excellent driver. He will get you back on time, no worries. 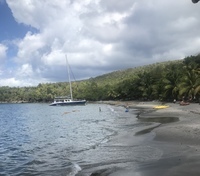 Terre du Haut, Les Saintes, FWI: Reportedly the best snorkeling here. great crepes at Crepes Galette immediacy next to the tourist office. Sorry we did not get off early and snag a golf cart; if you do, bring a credit card for the deposit. Nice lunch on the water at Cafe de la Marine, has WiFi. 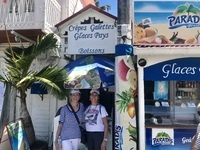 Basseterre St Kitts: When we got off the tender we noticed Bluewater safaris and so went on a catamaran snorkeling trip, lots of fun. Snorkeling ok. St Bart’s: Very charming, very French great shopping, St Maarten; Must be off the ship by 8:45 am. Many people go to Holland House, pay $25 for 2 lounge chairs on the beach, we went back to the DIvi. As a sailor, I always wanted to go on Windstar; it far exceeded my expectations. Kudos to Gede, assistant Maitre D, his boss Santos and Chef Oman for delicious meals that met our dietary restrictions. Kudos to Lufi, Cabin Steward, for a fragrance free chemical free cabin. Loved the marina, thanks to Jose for taking us each out for a sail on the Hobie cat. Enjoyed having the snorkel mask and fins provided by the marina; excellent fit. The itinerary is excellent, with long days on shore at each port. Very friendly people, engaging and well traveled, plenty of deck chairs, great crew show, Excellent gym with a recumbent bike and many classes.would definitely go on Windstar again. The cabin is small but very compact. Be sure you sign up for dinner at candles and Stella and for the barbecue and dining under the stars the last three nights. Pigeon Island, St Lucia is a luncheon barbecue on the beach. Sorry we did not sign up for the Wi-Fi package as it was a hassle to find Wi-Fi in the ports, and when we did it was usually spotty. We stayed at the DIvi the night before; just terrific. Barbuda: call walk on the beach. Dominica: very mountainous tropical one lane roads so be prepared to spend a lot of time driving around. 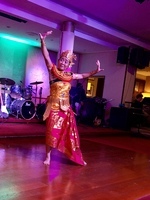 We booked privately with Antours to see the indigenous Carib, Annison himself was very interesting. Also did hot springs. Need to walk out of the port area, follow the yellow lines, if you want to do an excursion not part of the ship. The ship does a beach barbecue at this port, probably due to the miserable traffic. We took a private tour with James Touring Service in his 4 wheel Jeep, necessary if you want to go snorkeling at Ti Kaye resort as the driveway is extremely steep.Excellent snorkeling, lots of beautiful fish, clear water, pleasant lunch. James is very sweet, knowledgeable and excellent driver. He will get you back on time, no worries. Reportedly the best snorkeling here. great crepes at Crepes Galette immediacy next to the tourist office. Sorry we did not get off early and snag a golf cart; if you do, bring a credit card for the deposit. Nice lunch on the water at Cafe de la Marine, has WiFi. When we got off the tender we noticed Bluewater safaris and so went on a catamaran snorkeling trip, lots of fun. Snorkeling ok.
Must be off the ship by 8:45 am. Many people go to Holland House, pay $25 for 2 lounge chairs on the beach, we went back to the DIvi. Bring a European adapter or two as there is only one US outlet. Cabin has a safe and refrigerator. No balcony. Cabins on the third deck look to be much larger.